Jack Links beef Jerky is an interesting peppery taste and was thoroughly enjoyable. This is a great snack on a hot day as it keeps the electrolytes up. This is a healthy snack that the whole family can enjoy and is very nutritious. Click here to see ratings, reviews, and prices on Amazon! I took this jerky to the test and I do have to say if you can get a good bag of it, it was quite nice. It had a good flavor and was the perfect snack for the man on the go. Unfortunately to get to this you will have to go through you bag and cut all the disgusting fat off of your jerky. Also a lot of these bags come are mouldy and not edible at all. If you are going to buy this I would suggest checking that the bag is sealed and that it is not past its expiation date. If you follow these steps you should be right with buying it. Now for the taste of the jerky. As I have previously stated this has a peppery taste to it. I would not suggest this product if you are not a fan of spicy. Even a little bit. This jerky has a good flavor and is spicy but not too spicy. It has a good blend of all different flavors and is a good beef jerky. Overall I would say that this is a good jerky for the jerky lover. It perfectly combines the pepper and beef to make a snack that not only is healthy and good for the whole family but extremely yummy. Unfortunately the jerky suffers from the laziness of the company and its employees. 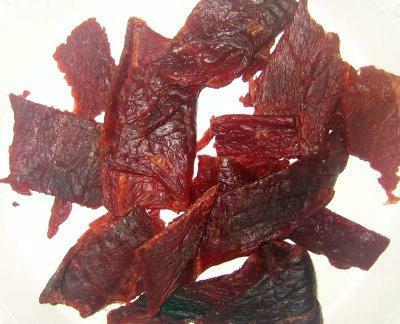 Often the jerky will be mouldy and there is always excess fat on the jerky, which should not be on the final product. 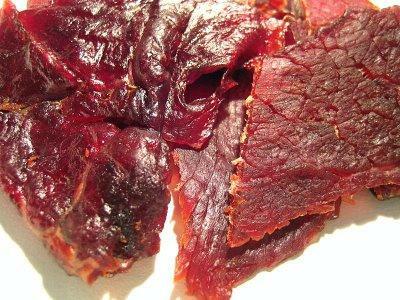 If you love jerky and can deal with cutting off excess fat then I would say go for it, but if you believe that this shouldn’t be the case I suggest that you move on and find another jerky.